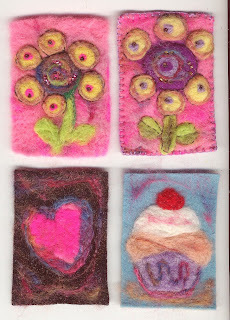 BIG ART ADVENTURE their challenge is using FELT, here are some felt ATCs I made. Fell in love with them after seeing them in my favourite magazine CPS. The top 2 atcs are 100% needlefelted, the bottom 2 are needlefelting onto felt. Joan these are GORGEOUS! So very sweet and precious - thank you for joining in with our challenge; I'm sure you will inspire people. These are WONDERFUL - I never ever would have thought of felt ATCs!! Absolutely super work and so glad you took part in our challenge. Gorgeous !! THis is definitely new to me. Needle felting is a mystery to me! Your felt atc's are lovely, however!